It is becoming increasingly important to make our posts appreciated and shared on social networks and one of the best ways to get traffic to our blog or site and boost sharing stats is to add social sharing buttons. In this tutorial we will see how to add a floating social media sharing bar below the title of Blogger posts, so when a reader scrolls down the page, he will still be able to see the sharing buttons without having to scroll back to the top. Adding the below jQuery script will make the buttons float in a fixed position as soon as they reach "the top" of the page. By scrolling back, the buttons will return to their initial position. 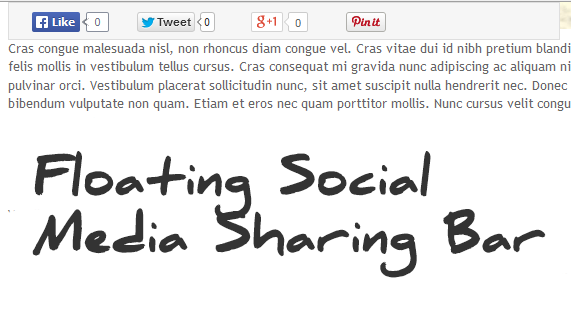 The social sharing bar includes buttons for Facebook, Twitter, Google+, and Pinterest. Step 2. Click anywhere inside the code area and press the CTRL + F keys to open the search box. Once you see the search box, type the </head> tag inside the search box and hit Enter to find it. To change the width of the bar, modify the 550px values in red. Note that this value also appears in the script which also needs to be modified. If the bar overlaps with the post content, then change 35px to a higher value. Step 6. Click on the "Save template" button and you're done! So these were the steps for adding the horizontal social buttons bar on Blogger. 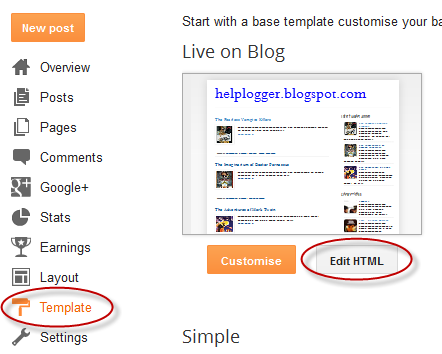 Using this bar it is also useful as it could help you to get more social traffic for your blog.